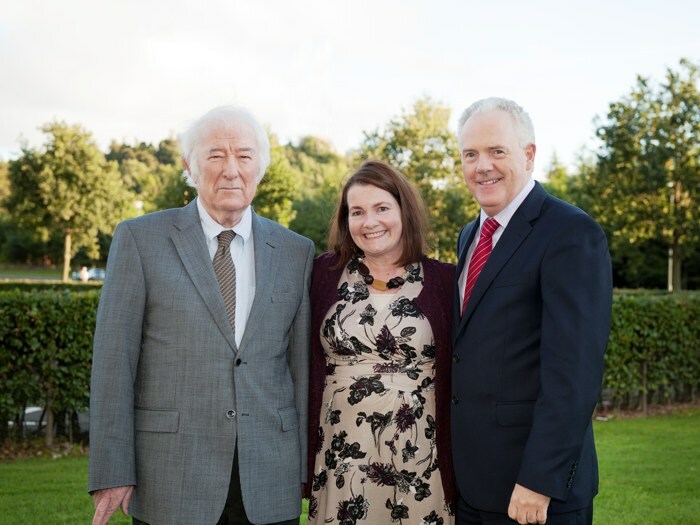 Seamus Heaney, the distinguished Irish poet, playwright and academic, visited the University of Stirling on 14 September to celebrate the launch of its School of Arts and Humanities. Heaney, the award winning recipient of the 1995 Nobel Prize for Literature, is also an honorary graduate of the University. His visit to Stirling allowed audience members to hear him read from his work and discuss his life and career with Alasdair Macrae, literary critic and retired senior lecturer at the University. Heaney’s visit, organised in association with the Royal Society of Literature, kick-started the official launch celebration of the University’s School of Arts and Humanities, which carries out world-leading research across a range of disciplines. Principal and Vice-Chancellor of the University, Professor Gerry McCormac, said: “We are delighted to welcome back Seamus Heaney – one of the world’s most influential contemporary poets – for this important event. Hearing him read his own world renowned poetry is a privilege very few people get the opportunity to experience. “The University of Stirling has a world-class reputation for Arts and Humanities through its research and innovative teaching programmes and is renowned for preparing high calibre graduates for successful careers in a range of related fields. “There is a strong commitment to the promotion of the arts at Stirling and we consider art and creativity to belong at the heart of the educational experience here.